A review of workers' compensation claims indicates that workers in Oregon's seafood processing industry are suffering serious injuries at higher rates than the statewide average, and the rate of injuries appears to be on the rise, researchers at Oregon State University have found. Researchers examined 188 "disabling" claims, or claims from employees who missed work, were hospitalized overnight or whose injuries left them permanently impaired. They found that the average annual rate of claims was 24 per 1,000 workers, said Laura Syron, a doctoral student in OSU's College of Public Health and Human Sciences and lead author of the study. 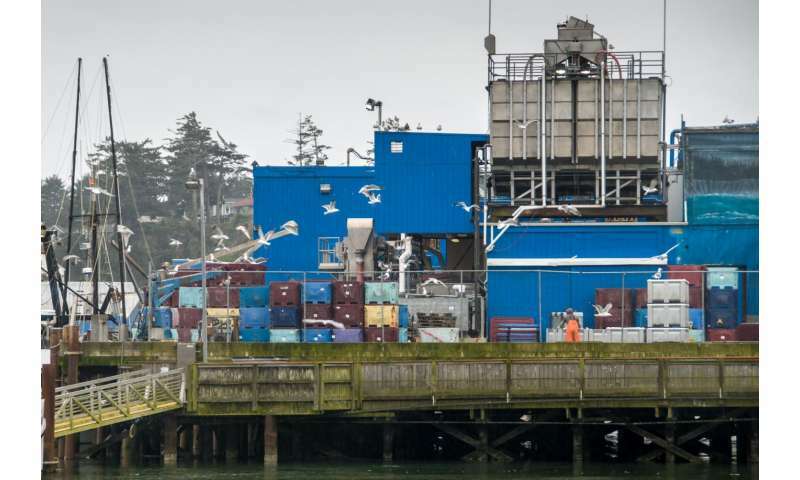 "Fortunately, Oregon's seafood processing industry did not experience any fatalities during the study period, but the rate of injuries during that period is higher than Oregon's all-industry average," Syron said. "This is an industry that merits more research and more support. Our goal is to use this information to assist seafood processing companies in the Pacific Northwest with protecting workers' safety and health." The study is believed to be the first to examine worker safety and health in Oregon's seafood processing industry. The findings were published this month in the American Journal of Industrial Medicine. OSU researchers collaborated with the Oregon Health Authority on the study. Co-authors of the paper are Laurel Kincl, an assistant professor of environmental and occupational health; Ellen Smit, an associate professor of epidemiology; environmental and occupational health doctoral student Liu Yang; and Daniel Cain, with the state of Oregon. The study is part of a broader effort at OSU to understand and address hazards in the maritime industry. "This important work compliments injury prevention my colleagues and I are conducting with commercial fishing fleets in the region," said co-author Kincl, who is Syron's advisor. Seafood is the most-traded food commodity internationally, and the value of processed seafood products in the U.S. topped $10 billion in 2015. The dangers of commercial fishing have drawn a lot of attention over the years through reality television programs and highly-publicized disasters and safety incidents. But there is limited research on occupational health and safety in onshore seafood processing, a food-manufacturing industry that includes cleaning, canning, freezing and other packaging and preparation. In Oregon, employment in the seafood processing industry grew steadily between 2010 and 2013, with 1,240 workers employed in the industry in 2013. "Processing is a critical component of the seafood supply chain, and it does not get as much attention as the fishing itself," Syron said. "Processing adds value to the product and it is also demanding work that can lead to significant injuries." The researchers' review of workers' compensation disabling claims accepted for compensation between 2007 and 2013 showed the rate of injuries among workers in the industry was more than twice that of Oregon industries overall. The most common injuries included traumatic injuries to muscles, tendons, ligaments or joints. The most frequent events that resulted in injuries were overexertion and contact with equipment or objects. "The workers' compensation data gives us insight into the most severe incidents and those that cost employers the most money," Syron said. The workers' compensation disabling data doesn't provide enough detail about the circumstances of the workers at the time of their injuries, so that is one area that warrants further study before prevention recommendations could be made, she said. For her doctoral dissertation, Syron plans to examine seafood processing in Alaska, where seafood is an economically and culturally important natural resource. In that research, Syron will continue to explore injury reports in both at-sea and on-shore facilities. With interviews, she hopes to learn from companies' safety and health managers and directors, whose roles are dedicated to protecting workers' well-being.